Dizziness symptoms can be the sign of a larger problem. The Vestibular System within the inner ear handles the body’s sense of balance. When problems related to the inner ear occur, most patients experience trouble with their own equilibrium, and display many varied symptoms such as dizziness, vertigo, nausea, loss of balance, sudden loss of coordination, and gait dysfunction. These symptoms may also be related to other diagnoses related to the overall vestibular system, such as benign paroxysmal positional vertigo, also known as BPPV or BPV for short, and Meniere’s disease. Vestibular rehabilitation programs (also referred to as dizziness or vertigo Physical Therapy) deal with the treatment of the central nervous system related to a functional deficit within the inner ear. These highly specialized programs, created by our Vestibular specialists Dr. James Pumarada & Dr. Asha Koshy, help our patients isolate the root causes of their symptoms while helping to treat vertigo & dizziness symptoms as well. At the completion of a course of treatment, sometimes comprising of only a few visits, patients experience extremely reduced dizziness & vertigo episodes and report an overall vastly improved quality of life. Unfortunately, most individuals, including doctors, do not even realize that vertigo and dizziness symptoms may be occurring as a result of a vestibular deficit and do not actively search for a Physical Therapy treatment solution to their problems. Even those that are aware of their vestibular problem are not aware that prescribed medications only mask problems, and that a Physical Therapist that is specially trained in Vestibular Physical Therapy can help get to the root of the problem and offer proven, non-drug solutions to coping with symptoms. At Complete Physical Rehabilitation, our doctors of Physical Therapy are the foremost vestibular specialists in all of northern New Jersey. 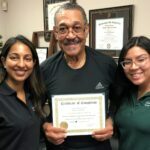 Dr. James Pumarada and Dr. Asha Koshy each have 17+ years of experience in Vestibular Physical Therapy and are the only Certified Vestibular Physical Therapy Specialists in Elizabeth, Jersey City, and Hudson County. 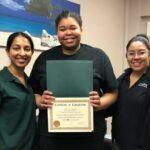 They also consistently and continually employ the most up-to-date rehabilitation methods through special certification courses, including the completion of the highly regarded and intensive American Physical Therapy Association Competency Certification for Vestibular Rehabilitation course at Emory University in Atlanta, one the foremost institutions for Vestibular treatment and research in the United States. 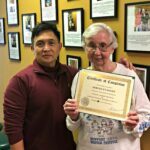 Upon the first visit, once a patient has undergone a Physical Therapy evaluation, a Physical Therapy treatment program is created consisting of highly specialized head, body, or eye exercises. These specific exercises, performed in the clinic and tailored to the individual patient’s symptoms, help to achieve the goal of retraining a patient’s central nervous system so that the brain can correctly process all sensory signals, thereby eliminating all symptoms. In addition, simple home Physical Therapy exercises are also prescribed by our Physical Therapists to be performed in the event of small recurrences of symptoms. At the end of a course of treatment, the vast majority of our patients have reported a significant decrease in symptom recurrence, with many stating that symptoms have almost completely resolved.